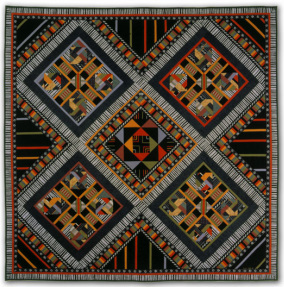 This collection of quilts represents several geometric styles that I enjoy working with. Combining squares, circles and triangles can be a never-ending exploration into design possibilities. Pictured on the left is "Divided We Stand #4" It is 22.5" x 22.5" not including the frame (not shown). I have used cotton fabrics, along with metallic thread, which gives it just a hint of sparkle. The quilt is pieced, fused, and appliqued. The framed size is 30.5" x 30.5" $1200. 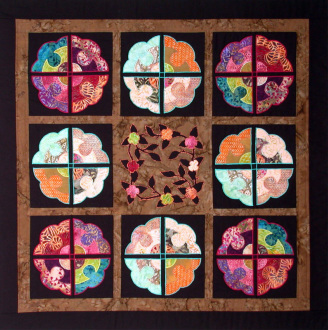 "Divided We Stand # 3"
Cotton fabrics, metallic thread, pieced, appliqued, quilted. Framed size is 34" x 34"
Cotton fabrics, pieced, appliqued, quilted. Glass beads. Cotton fabrics, pieced and appliqued. 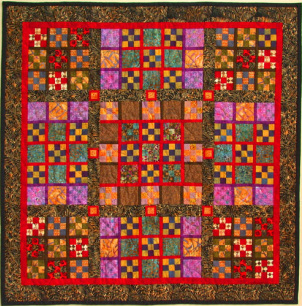 Hand-quilted. 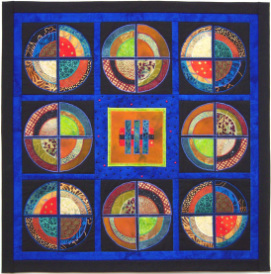 Soul-Catcher Mosaic 53.5 x 51in. $2500. 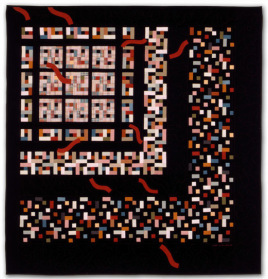 "Versicolor" 30.5" x 30.5" This quilt gets attention with it's vibrant colors.